The consecration of artists by major art institutions usually increases their value, but simultaneous exhibitions by Jeff Koons in Basel and Frankfurt and by Damien Hirst in London are having the opposite effect. Alarmists believe that a subprime crisis is in the making. Beginning in the mid-eighties, the price of works by Jeff Koons rose spectacularly, culminating in 2007 when he broke the auction record for any living artist. But the coronation by major museums of the “King of Kitsch” has not boosted his market value. Following a string of sales that have fallen short of their estimated prices, Christies is being cautious in an upcoming sale in June. The same is true for Damien Hirst whose major retrospective until September at Tate Modern London during the Olympic Games has not arrested a dramatic downturn in his earnings. According to data from the UK Art Market Research indexes, Hirst has consistently underperformed since 2008. Ironically, Hirst himself contributed to this situation by flooding the market when he sold his works directly. He is said to have a personal fortune of over £200m. Not so long ago, the Koons and Hirst were the darlings of the art market. Buoyed by the new wealth that has invested lavishly in contemporary art since the eighties – often as a means of social promotion – both artists responded by supplying art that is bold, spectacular and saleable. Neither actually makes the works themselves. Koons uses as many as 100 workers at a time. The same network operates throughout the art world, Fibicher points out, which explains the overnight success of artists like Urs Fischer, the Swiss installation artist who lives in New York. Fischer can now be found everywhere that Koons has been, including in the same art collections. “This monopolizing tendency is a dangerous power instrument. It can make an artist emerge very quickly, but it can also make him disappear within a year,” warns Fibicher. The same actors wield an immense influence. Julian Spalding, art critic and former gallery director, goes even further: he suggests that museum directors and dealers are actually in bed together. In Con Art – Why You Ought to Sell Your Damien Hirst While You Can, a book that has stirred a hot debate in the UK, he explains that the withdrawal of public funding from museums in the nineties allowed art merchants to rush in. “Modern museums have become showcases for the art trade,” he told Swissinfo. He cited the example of the Garage Centre for Contemporary Culture in Moscow, founded by Daria Dasha Zhukova, the life partner of billionaire Chelsea football club owner, Roman Abramovich. “It looks every way like a public museum, but it is run by dealers,” said Spalding. Collectors share their collections with the public not for altruistic purposes, he said, but to raise its value, including in monetary terms. François Pinault, with his Palazzo Grassi in Venice, or Eli Broad with his museums in California and Michigan are doing nothing else. The world is awash with collectors looking for visibility to guarantee a return on their investments. The bigger the better. “Politicians are delighted, because they don’t have to finance the ventures or the venues,” Spalding added. Caroline Bourgeois, curator for the François Pinault Foundation, and responsible for the current crowd-stopping, if controversial, Urs Fischer exhibition in Venice, Madame Fisscher, refutes the suggestion that the Pinault collection is in there for the money. It owns and presents at least 70 percent of lesser-known-or-yet-to-be-discovered artists, Bourgeois insisted. The “monopolizing tendency” to which Fibicher refers, and that some qualify as quasi-incestuous, has blurred the roles in the art world and raises the question of the independence of directors and curators from merchants and collectors. When dealers become collectors (Gagosian) or even museum directors (Jeffrey Deitch, Museum of Contemporary Art in Los Angeles), artists become merchants (Hirst), collectors buy auction houses (Pinault) or sponsor their own shows in museums where they are board members (Joannou) or a former Minister of Culture becomes art consultant (Jean-Jacques AIllagon in France), insider trading is a given. The same people can impose their choices, and while they are at it, the prices as well. The artists, according to Spalding “are just monkeys on the barrel”. The result of “con art”, which he traces back to Marcel Duchamp and Joseph Beuys and defines as “contemporary conceptual art”, has been reinforced by art education in the UK. In the seventies, it became fashionable to think art rather than make it. “It was higher education on the cheap,” he said. The result, he said, is “the black-hole of western culture,” where the vacuity of art collectors is only matched by the emptiness of the art they collect. Legendary dealer, Charles Saatchi, he said, was never anything other than a publicist. Spalding is convinced that a rude awakening is in store and that it will lead to the collapse of the art market. “Get rid of your Hirsts, quickly,” he repeated. Spalding has challenged the Director of the Tate, who pushed the current Hirst retrospective, to a public debate. Sir Nicholas Serota has declined on the grounds that he does not want to help promote Spalding’s book. 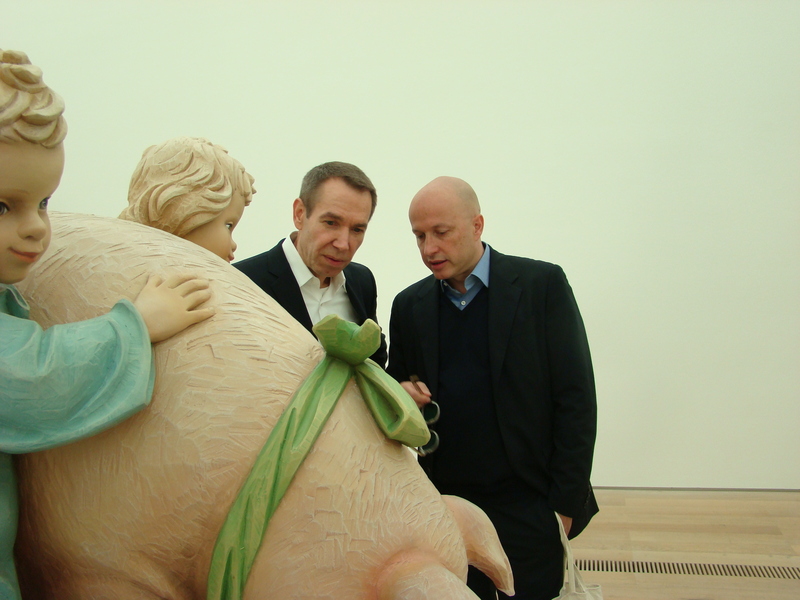 The timing of his exhibition at the Beyeler Foundation to coincide with Art Basel (14-17 June 2012) – the major international art fair where most of his collectors will be present – indicates that Jeff Koons may still be calling the shots. – Koons museum solo shows include the Deutsche Guggenheim, Berlin (2000), Kunsthaus Bregenz (2001), the Neue Nationalgalerie, Berlin, and on the roof of the Metropolitan Museum of Art, New York. In 2008, 17 Koons sculptures were presented in the gardens of the Chateau de Versailles. More recent shows include Museum of Contemporary Art, Chicago (2008), the Serpentine Gallery, London (2009) and the upcoming ones in Frankfurt, Germany at Schirn Kunsthalle and Liebieghaus Skulpturensammlung (20 June – 23 September, 2012). 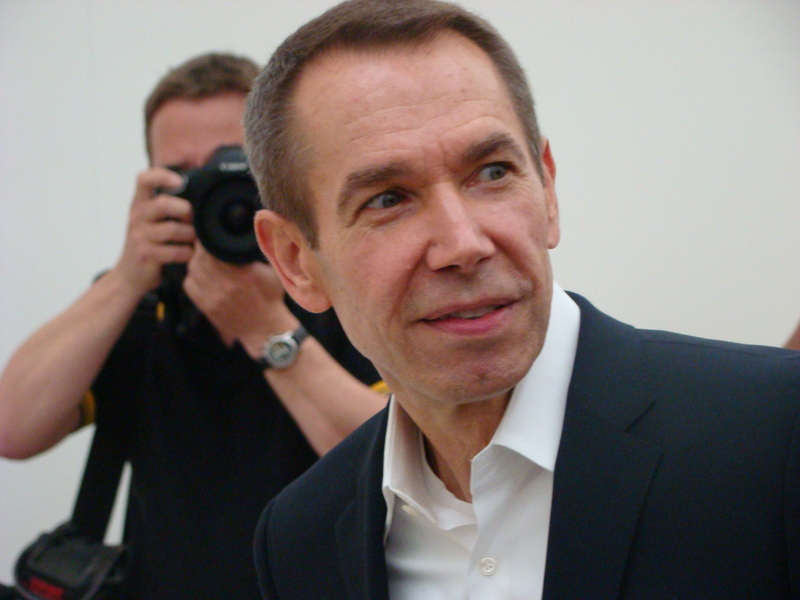 – In 2007, Jeff Koons broke all price records for any living artist. Hanging Heart (Magenta and Gold), one of the five different color versions of a 2.6-meter tall stainless steel heart was sold for $23.6 million. In 2008, Balloon Flower (Magenta) was sold in London for £12,9m (US$25,8m). – During the 2009 recession, auction sales of high-value Koons works dropped by 50 percent. – In November 2010, Balloon Flower (Blue) was auctioned by Christies for only $16.8. – In May 2011, Pink Panther was sold by Sothebys at a disappointing $16.9m, falling short of the estimated $20-30m. – In June 2012, Christie’s London will sell Jeff Koons’s Baroque Egg, conservatively estimated at between £2.5-3.5m ($4m-$5.6). Previous ones were sold for $5.4 in 2009 and $6.2 in 2011. – French luxury goods industrialist François Pinault was behind the Koons exhibition at the Versailles Palace in France in 2008 and he regularly exposes Koons in Venice, both at Palazzo Grassi and the recently opened Punta della Dogana that house his art foundation. Pinault is also the majority share-holder of auction house, Christies. – Greek construction tycoon Dakis Joannou commissioned the American artist to paint his 35 meter yacht, which Koons covered in a kaleidoscopic pattern of yellow, blue and black and christened Guilty. Joannou, who owns some 38 works by Koons, presented his collection at the New Museum in New York in June 2010 and asked Koons to curate the show. The collusion caused a public outcry. – American entrepreneur, Peter Brant, whose colorful marriage to Jane Seymour gets higher coverage than his art collection, has installed the Koons four-story tall Puppy in front of the recently created Brant Foundation Art Study Center in Greenwich, Connecticut. – Jewish-Ukrainian oligarch, Victor Pinchuk has founded the PinchukArtCentre in Kiev, one of the largest centers for contemporary art in the Eastern Europe and has invited Jeff Koons to be on the jury of the Future Generation Art Prize. – American philanthropist Eli Broad is increasing by two the museums meant to house his art collection, including 24 works by Koons. The Broad Contemporary Art Museum (BCAM) at LACMA openend in February 2008. It was designed by Pritzker Prize-winning architect Renzo Piano, Construction of the Eli and Edythe Broad Art Museum at Michigan State University, East Lansing, designed by Pritzker Prize-winning architect Zaha Hadid began in 2010. The Broad, a new, public museum of contemporary art in downtown Los Angeles (anticipated opening: 2013) has been designed by world-renowned architects Diller Scofidio + Renfro. – Architect Rem Koolhaas and Russian socialite Dasha Zhukova have recently unveiled plans for a new space for the Garage art gallery: a ruined Soviet-era restaurant in Moscow’s Gorky Park. – Koons’ monumental sculpture Tulips, from the “Celebrations” series is installed outside the American consular building in Beijing. Koons says of the 10-year loan to the State Department Art in Embassies program that tulips are a symbol of good luck in China.